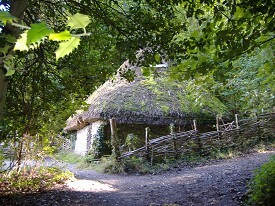 Hangleton Cottage at the Weald and Downland Open Air Museum is a reconstruction of a two room flint cottage. The exterior walls are made of flint, and the roof is straw thatch, the most likely roofing material of the area. The fire is built in the middle of the room, there is no fireplace, smoke will go upwards and out of the thatch and two holes at the apex of each end of the roof. 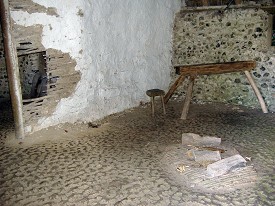 The second room contains a large bread oven. The interior wall is made of wattle and daub. Bayleaf is a late Medieval/early Tudor hall house.The central 'hall' room is a high, one-storey room with a central fire and no chimney. The walls are wattle and daub with a tiles roof. Either end of the building is two storied, with two service rooms at one end with storage over them; and the other end is the family living quarters, the parlour downstairs and solar (bedroom) upstairs. 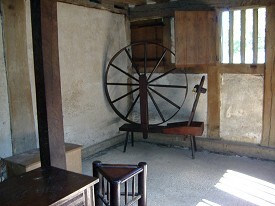 Bayleaf Farmstead at the Weald and Downland Open Air Museum. 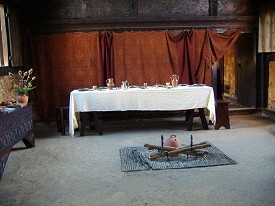 Note the central fire, linen covered top table with wall-hanging behind. 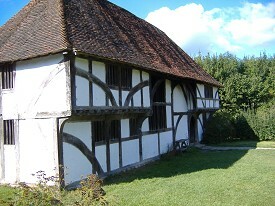 The lime-washed wattle and daub wall discoloured by smoke. The parlour is the the living and working room for the women. The term parlour comes from the French, parlez - to talk, as it was believed women always gossiped when working! The spinning and other 'clean' chore would have been done in here. 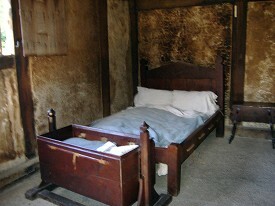 This bed and cot are in the parlour in Bayleaf, a probable place for children to sleep.